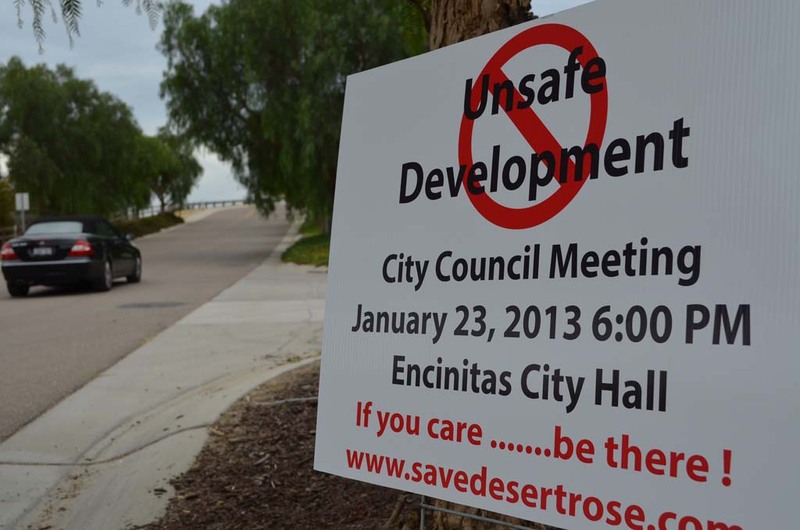 ENCINITAS — The developers behind the “Desert Rose” development must complete an environmental impact report to push the project forward, a Superior Court judge ruled on April 25. The council was wrong to approve the development in northeastern Olivenhain without seeking such a document, Judge Judith Hayes said in her decision. Substantial evidence exists “to make a fair argument the project may cause a significant adverse effect on the environment,” Hayes said. Woodridge Farms Estates, the developers, want to build 16 homes on a 6-acre parcel. Normally, city zoning would grant a maximum of 11 houses there, according to Roy Sapa’u, senior planner with the city. So in exchange for promising to dedicate one home to a low-income family, Woodridge Farms was granted the additional units. Save Desert Rose, a group made up of Olivenhain residents fighting the development, has argued the project would create traffic problems, hurt a nearby wetland and harm trees in the area. After the city approved the project more than a year ago, Save Desert Rose filed a lawsuit to compel an environmental report. In the coming weeks, Hayes will decide whether to overturn council’s original approval of the project. If the council vote is overruled, the Planning Commission and council will once again consider the project. With an environmental impact report shining a light on the project, the city would be more likely to reduce the number of homes and increase the wetland buffer, said Everett Delano, a lawyer representing Save Desert Rose, last week. “Theoretically, an EIR should get to a project everyone can agree with,” Delano added. Marco Gonzalez, the attorney representing the developers, did not respond to requests for comment. Increasingly, residents have voiced concerns over density bonus developments. In response, the council recently sent a letter to the League of California Cities in hopes of gaining backing for more local control over the projects. But so far, the city has found little support for amending the law. As it stands, the council has stated it’s difficult to deny the projects because state law takes precedence over local zoning. According to Hayes’ decision, the developers’ side argued that the city had no choice to approve the project under California density bonus law, regardless of the potential environmental impacts.